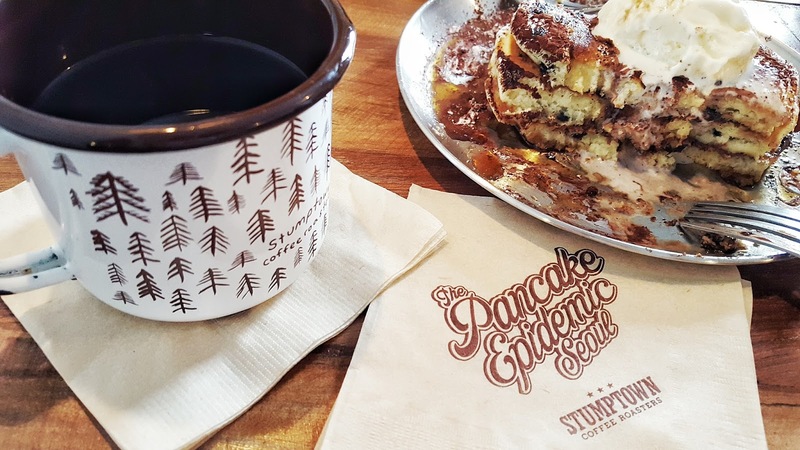 Everyone has their favorite comfort food and pancakes are one of mine. 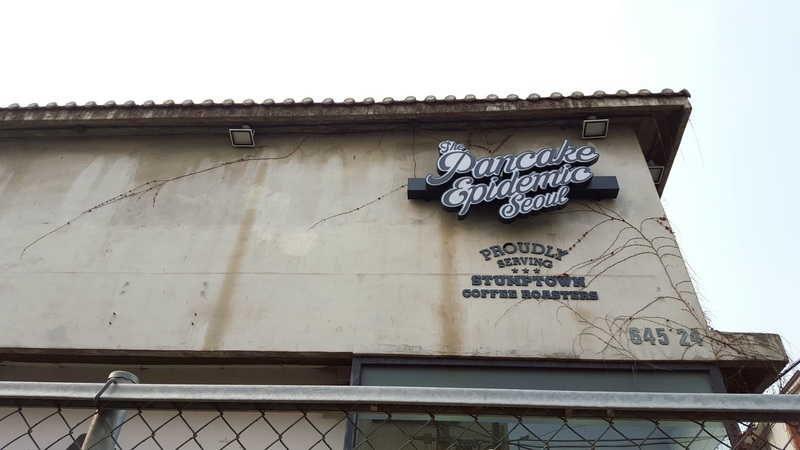 But really delicious, fluffy pancakes are a treat to find in Seoul. 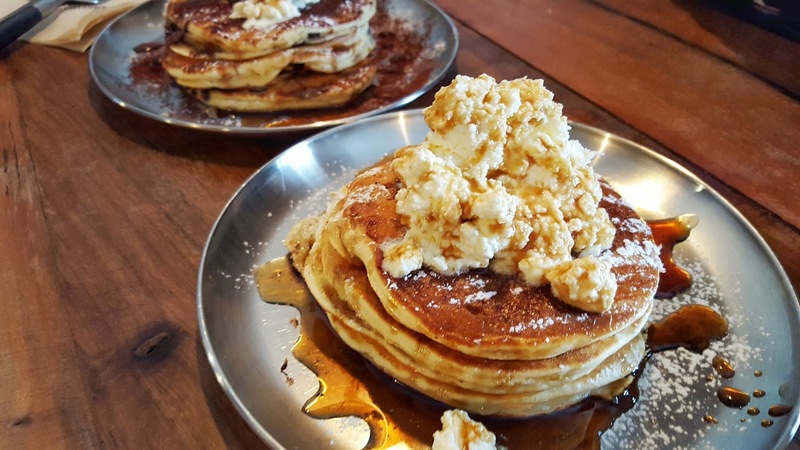 I am always hunting for a new pancake house, so when I spotted some drool-worthy stacks on Instagram, I knew I had to find them. Like any good Seoulite I took to the internet to get the scoop on this local shop. Apparently the establishment calls LA home, so I gave them immediate pancake credibility. LA has a strong brunch scene. Their website doesn’t give much information but I was able to get their Seoul address and was on my way soon on my way. With my brunch bestie by my side, we trekked in to Seoul. Surprisingly, we didn’t get too lost and almost walked right to it. I will have detailed directions below, so keep reading. The vibe of the shop was exactly what I imagined. Hipster and modern, yet rustic. Hardwood, bricks, concrete, and steel are the main elements and give a lodge-like feel. It was quite busy when we arrived, and this open area was filled, so we snagged a table in the back and went to order. The menu is pretty basic. Pancakes and coffee. That’s all we wanted. 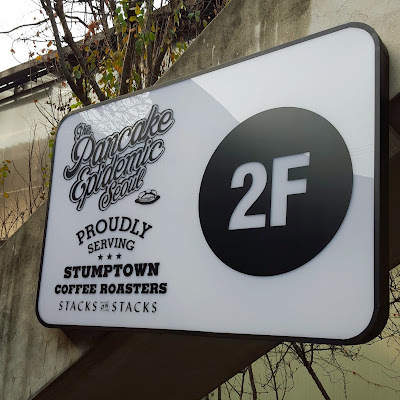 They serve a variety of coffee drinks and the roasts they use from Stumptown Coffee Roasters were delicious! We opted for 2 hand drips; one the Hair Bender house roast and one Rwanda roast, so we could try them both. 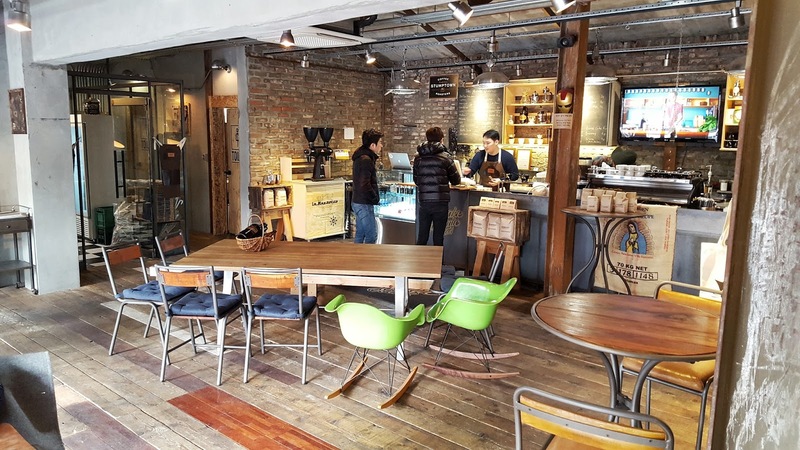 It has the Apgujeong price tag so be prepared to spend about 6,000won on a cup. Now for the hard part, which pancakes? Sadly the brownie pancake was sold out as that was our first choice. So we opted for the Pinut Nutella (Peanut butter Nutella typo) and the Original. They also offered a Carrot Cake pancake and do change their offerings seasonally. Prices were anywhere from 6,800-12,800won depending on the size (3 or 6 stack) and variety you order. 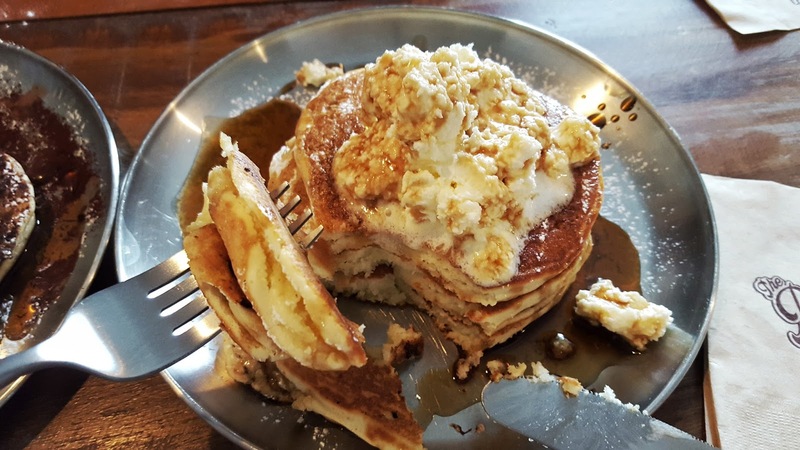 The pancakes came nicely stacked (3 to a stack) with toppings and fillings galore! We shared them and they were the perfect amount. 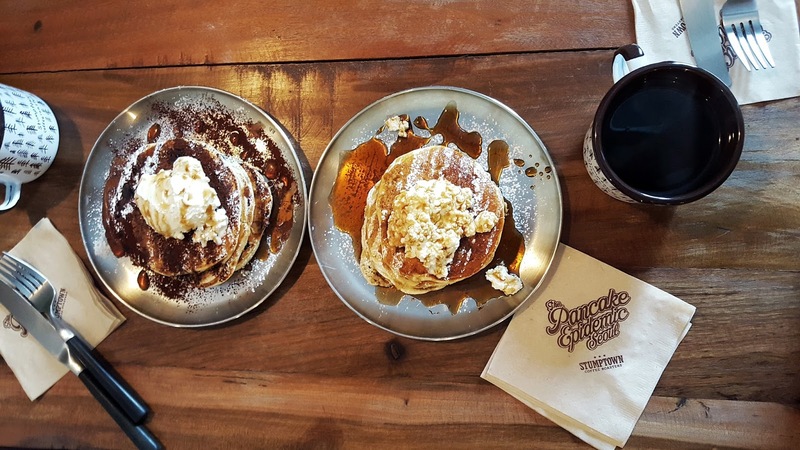 The Goldilocks of pancakes if you will-not too small, not too big, just right. The nutella pancakes had a nice crunch with the peanuts and were topped with a scoop of icecream. The original ones took my heart as they were topped with maple syrup and whipped butter. I’d go there again just for the butter! Overall it was a perfect spot to share a short stack over coffee with friends. I’d highly recommend it if you are in the area and want to treat yourself to something special. 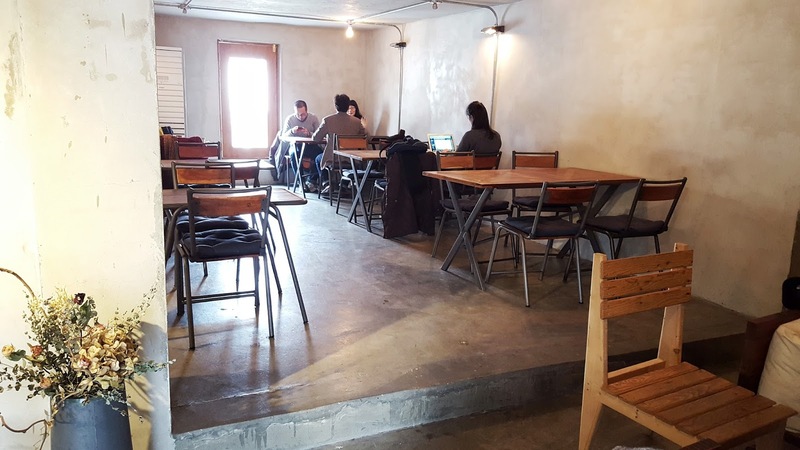 They are located in Apgujeong Rodeo neighborhood. I did a video of the neighborhood so check that out if you want to get a glimpse of the area. Go out Apgujeong Rodeo Station (yellow line) exit 6. Walk straight about 5 minutes until you see Apgujeong-ro 46 gil (압구정로 46 길) Turn left and walk straight down that street about 10 minutes. You’ll go through a few intersections. You will eventually come to an intersection at Unju-ro 168 gil (언주로 168 길) You’ll see the sign for The Pancake Epidemic to the right, on the second floor of that building on the corner. Other locations inside the Hyundai Department stores in Apgujeong and Coex. Check out their Facebook page, too.